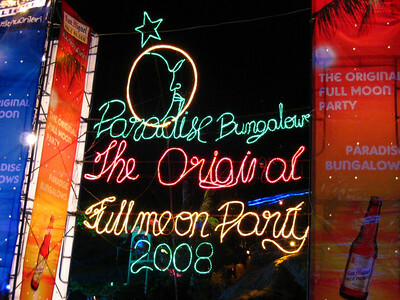 SummerChasers Stories: Full Moon Party! we came, we saw, we partied under the full moon. An eclectic group (Canucks, Brits, Germans, Thais) of us from the bungalows ventured across the strait to the other island of Koh Phangan to see just what all the fuss is about regarding this famous full moon party. Well, really, not much. The Brit(Ed) and I agreed that besides the fact that it's on a beach and it's the full moon, there are big parties like this back home (i.e. Commerce or Corn & Apple socials) that seem even more out of control. Good times though. Drinks are mickeys dumped into a plastic bucket with a can of mix, ice and the ever-optional Red Bull. The beach is lined with restaurants and bars, each with their own massive sound system pounding the beats out onto the beach. And yes, one of them played typical social music, complete with Brian Adams' "Summer of 69". All places charge around 10-20baht to use the toilet and some got pretty gross; thus there could often be a row of guys with their pants hiked up peeing in the ocean but tough luck for the girls. The bulk of our crew left early but Julie and I stayed a bit later. We found a balcony overlooking the party and just took in the action. For some reason we were not content with the drink selection so we figured we could make our own for cheaper. So we bought a bottle of booze, some mix, a big bag of ice and a bucket and a nice cashier gave us some straws. Are we cheap Winnipeggers or what?? Around 3am we'd had enough and queued up for the boat ride home.